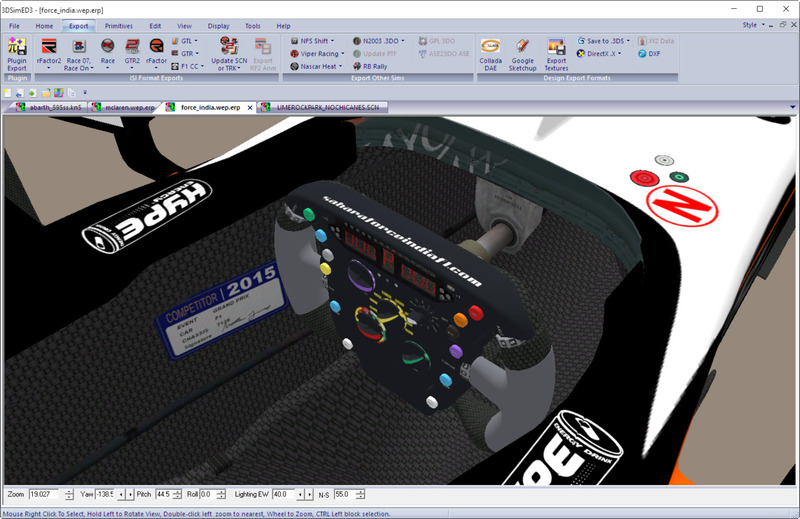 New: Import Plugin for F1-2016 cars and tracks. The plugin works with ERP files found in WEP sub-folders of cars or tracks. New: Decal attribute added to Object Instance Edit pane for rF2 .GMT export allowing objects to be placed on top of other objects. New: Transparency attribute added to Object Instance Edit pane for Assetto Corsa .KN5 allowing the transparency of a mesh to be overridden. In earlier versions the mesh transparency was always set from the transparency of the mesh material. 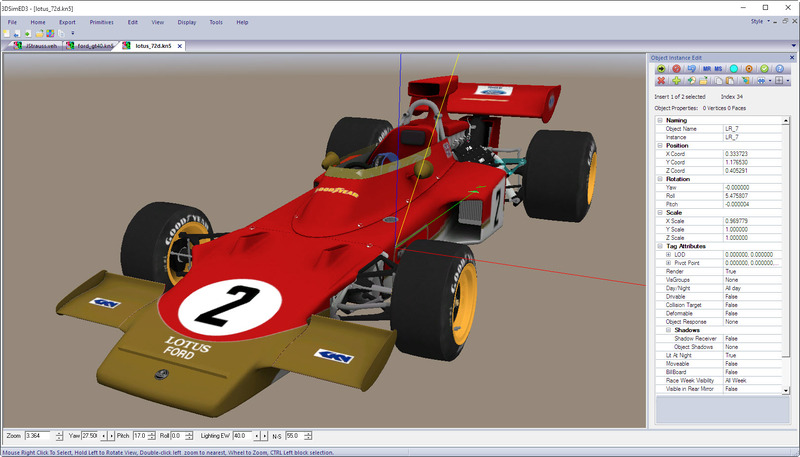 New: F1 2002 .MTS import and export now includes support for multi-map materials. Enhanced: Export to rF2 now always saves the pivot point. 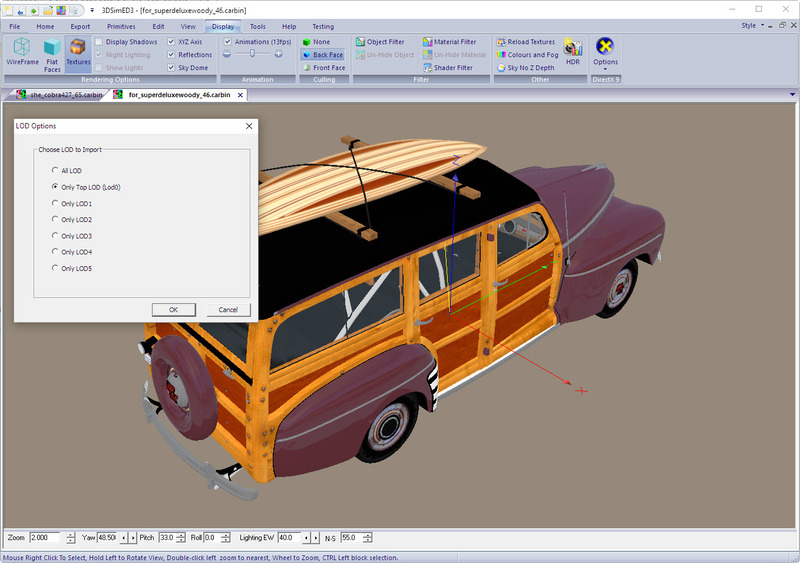 Enhanced: The texture browser dialog gives more details for DDS files and previews more DDS formats. Fixed: MR button on the Pivot Point dialog would give incorrect xyz. 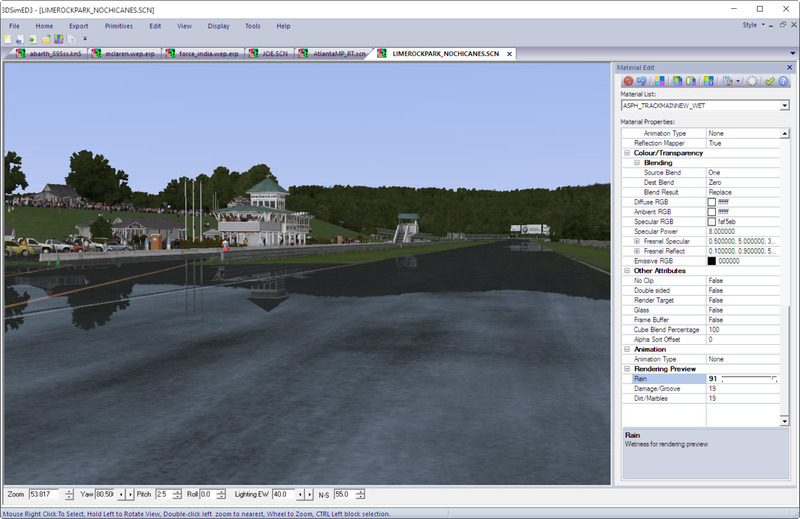 The new version of 3DSimED is available. Support is now included for Rieza Studio’s Automobilista with a full set of Rieza shaders as well as SPRL shaders allowing models to be created taking full advantage of Automobilista’s rendering capabilities. With the addition of the third party tool, rFactorDec.exe, 3DSimED can now call this tool to export Automobilista .GMT with the required encryption. For those editing Assetto Corsa cars there is a pixel shader to render the main car shader, ksPerPixelMultiMap_damage_dirt, so skins will correctly visualised. A new Toolkit function, Texture Replace From Folder, makes it much easier to replace liveries and find missing textures. A re-worked Shader Select Dialog allows game filters to be set which should assist users to correctly target games such as rFactor 1 & 2, Automobilista, and Assetto Corsa. For a full list of the new features and fixes in 3.1d please see 3DSimED 3.1d release notes. 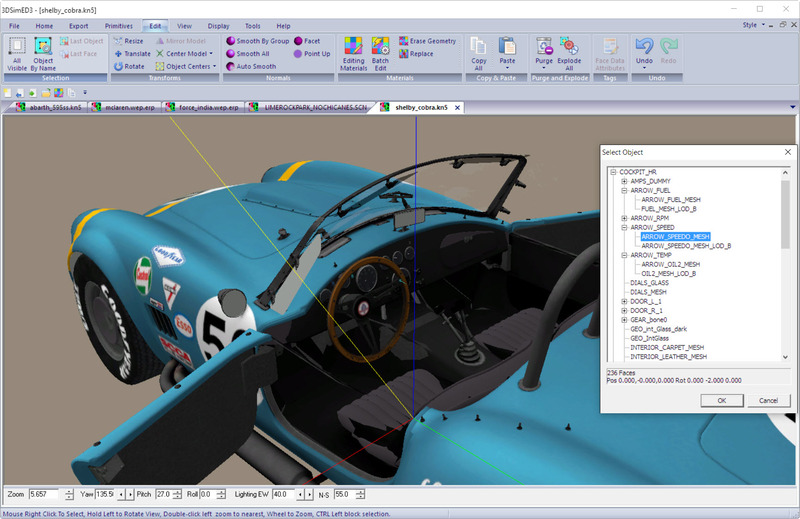 Automobilista Formula Retro model showing the car shaders. Assetto Corsa Lotus 72D with Gold Leaf livery. A new version of 3DSimED is available which includes the import of F1-2015 tracks & cars. All cars and tracks included in the games can be imported directly from the game ERPs without any need to unpack, which should be useful to those creating new skins, decals and other mods. 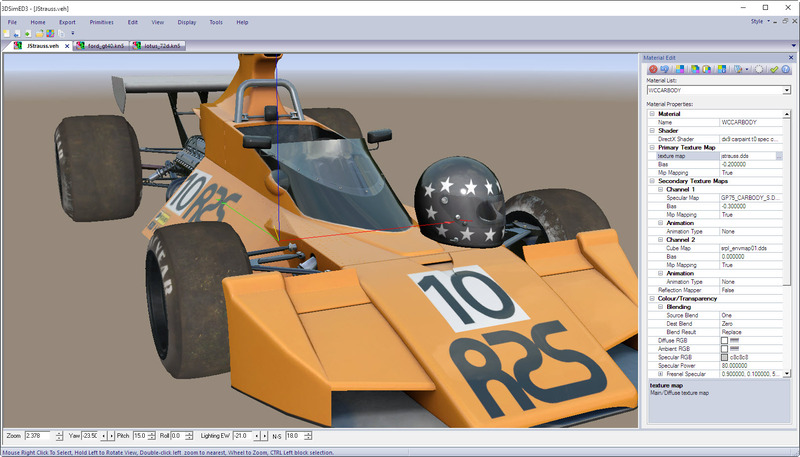 With the new Material Batch Edit function Version 3.1c continues to build on its ability to easily create models for games such as rFactor1/2, Assetto Corsa, GTR2 etc. and its plugin architecture allows it to be able to import and export to an ever-growing number of other formats including other 3D editors such as 3DS Max and Blender. For a full list of the new features and fixes in 3.1c please see 3DSimED 3.1c release notes.